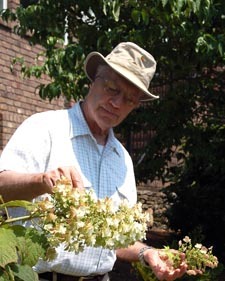 When Eddie Aldridge and his father saw their first ever Snowflake Hydrangea in the Alabama woods in 1969, they knew they were seeing an extraordinary plant. The father and son, noted internationally for their work with Hydrangeas, patented the Snowflake in 1971 and propagated it to bring the flower to prominence. They never took a single royalty but simply wanted the world to know of this new species. It isn't often that gardens in the South are covered with snowflakes, but Aldridge Gardens will glisten every summer from the stunning white blooms of the Snowflake Hydrangea. This signature flower of Aldridge Gardens is so named for the intricate flowers that look like magnified snowflakes. The plant, which was once extraordinarily rare, now grows in gardens around the world, thanks to Eddie Aldridge. And, the family's dream of developing a showcase for all hydrangeas has been realized in Aldridge Gardens.